As Supernatural heads into Season 13, we can’t help but wonder who might be gracing our screens alongside Sam (Jared Padalecki) and Dean Winchester (Jensen Ackles). Through 12 seasons, Supernatural has seen quite a few characters come and go. The variety keeps the show interesting, but there are those fan favorites that everyone can’t wait to see. Even when a character dies, Supernatural sometimes finds a way for them to return. Here’s what we do and what we don’t know about what characters will make an appearance in Season 13 of Supernatural. Sheriff Jody Mills (Kim Rhodes) will be appearing in Season 13 of Supernatural along with her foster daughters Claire Novak (Kathryn Newton) and Alex Jones (Katherine Ramdeen). Angsty teen Claire has become a full-fledged hunter, while former vampire captive Alex has tried to make a life outside the supernatural world. Another fan favorite is Sheriff Donna Hanscum (Briana Buckmaster), and viewers have been looking forward to seeing her reunite with Sheriff Jody. Fans will get that chance because a Wayward Sisters spinoff is in the works. The backdoor pilot, which will be episode 10 of Season 13, will include Jody, Claire, Alex, and Donna, as well as some new faces. They will be joined by new character Patience Turner (Clark Backo). Patience is the estranged granddaughter of psychic Missouri Moseley (Loretta Devine), who last appeared in the Season 1 episode “Home.” Patience has inherited her grandmother’s gift, which leads to her being hunted by dark forces. Yadira Guevara-Prip will also join Wayward Sisters as Kaia Nieves. After losing her family to supernatural tragedy at a young age, Kaia struggles with her own gift­ – the ability to walk between worlds in her dreams. Supernatural has gone from being criticized for a lack of female representation to birthing a series based around a group of strong women. Let’s hope the original series continues to introduce interesting female characters. One of the characters who will be coming back in Season 13 is the Archangel Michael. Dabb told EW.com, “The Michael of apocalypse world is the victor. He’s a very different character than the one we met even in Season 5. He’s Genghis Khan. He’s been through the wars. He’s conquered the world.” In the Supernatural world we’re familiar with, During Season 5 Michael possessed young John Winchester (Matt Cohen) in “The Song Remains the Same” and John’s son Adam (Jake Abel) in “Swan Song.” In the parallel universe John Winchester is dead and it’s likely that half-brother Adam was never born. The apocalyptic version of Michael will be played by Christian Keyes. Kevin Tran (Osric Chau) may be returning, but he won’t be the same. Image by kfox/The Supernatural Fox Sisters. Who else will Lucifer (Mark Pellegrino) and Mary Winchester (Samantha Smith) run into? With Mary Winchester (Samantha Smith) and Lucifer (Mark Pellegrino) trapped in the Alternative Universe perhaps we’ll get to see some favorite characters return­ Meg, Ruby, Charlie…the possibilities are endless. Mark Sheppard has told fans that he won’t be returning Season 13, and it would be somewhat anticlimactic for a parallel universe Crowley to come back after his stunning sacrifice at the end of Season 12. On the other hand, it would be fascinating to meet a version of Rowena who survived an apocalypse. Lucifer’s newly born son Jack (Alexander Calvert) may be the key to getting Mary back to her own sons. Jack, who is half-human and half-angel, will struggle to find his place in the world. While Sam and Dean may have different perspectives on Jack, they will attempt to exert an influence on the young Nephilim. Will Jack be good? Will he be evil? Though Sam and Dean may try to nurture the good, will being the devil’s son give Jack a nature that can’t be overcome? Castiel (Misha Collins) had committed to raising Jack, but Lucifer’s blade got in the way of that plan. Though it’s been confirmed that Misha Collins will be returning, it’s not clear when or how, or if he’ll be the same Castiel we all know and love. Donatello Redfield (Keith Szarabajka), prophet of the Lord, who we last saw in the Season 11 episode “All in the Family,” will join Sam and Dean in Season 13. As far as new characters, there’s still one Prince of Hell walking around–Asmodeus (Jeffrey Vincent Parise). With his princely siblings and Crowley gone, he sees an opening to make Hell his own. In terms of more unusual guest stars, Scooby Doo will make an appearance in an animated episode 16, in a highly anticipated crossover. Rut Roh, Sam and Dean! 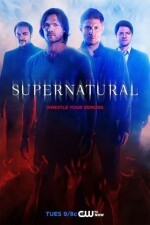 At the end of Season 11, Supernatural experienced a lot of off-screen changes, including new showrunners and a host of new writers, as well as some new directors. Andrew Dabb and Robert Singer will continue as co-showrunners, and we’ll be getting that same consistency with the writing team. Richard Speight Jr. (Gabriel) will be back to direct two more episodes. With one of his recent efforts, “Stuck in the Middle (With You),” being one of our Season 12 favorites, we can’t wait to see what Speight will bring to Season 13. Supernatural returns for Season 13 on Thursday, October 12, at 8pm ET on The CW. This looks like an interesting season. Shows grow and change over time and I actually like the way this show has changed over the years, even though there are always those grumpypants who want the show to be like it was in the first five seasons. The show changes because sometimes it’s core mission is different from what happened in the first seasons. I am glad we’ve gotten back to the heaven/hell plotslimes though. I think that should always have been the shows focus,with the random monster execution thrown in for flavor.